Article first published as Batter Fried Chicken on Blogcritics. MAKE BRINE Whisk water, salt, and sugar in large bowl until sugar and salt dissolve. Add chicken and refrigerate for 30 minutes or up to 1 hour. MAKE BATTER Whisk flour, cornstarch, pepper, paprika, cayenne, baking powder, salt, and water in large bowl until smooth. Refrigerate batter while chicken is brining. FRY CHICKEN Heat oil in large Dutch oven over medium-high heat to 350 degrees. Remove chicken from refrigerator, pour off brine, and pat dry with paper towels. Rewhisk batter. Transfer half of chicken to batter. One piece at a time, remove chicken from batter (allowing excess to drip back into bowl) and transfer to oil. 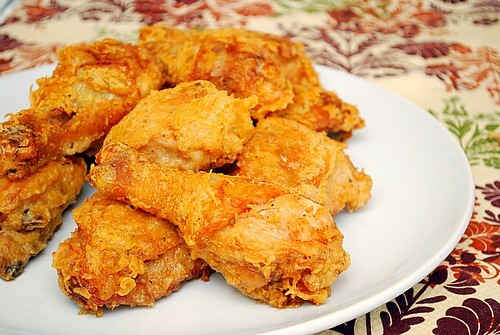 Fry chicken, adjusting burner as necessary to maintain oil temperature between 300 and 325 degrees, until deep golden brown and white meat registers 160 degrees (175 degrees for dark meat), 12 to 15 minutes. Drain chicken on wire rack set inside rimmed baking sheet. Bring oil back to 350 degrees and repeat with remaining chicken. Serve. How timely! My girlfriends and I were just talking about having a fried chicken party before the weather turns too hot in chicago. Did you use Kosher salt for brining?